Land is still being cleared for Star Wars over at Disney’s Hollywood Studios and the flat New York skyline facades are completely gone now. Toy Story Land is coming along now that all the pavement has been removed, the entire production tour building has been removed and the old Streets of America city hall is gone. 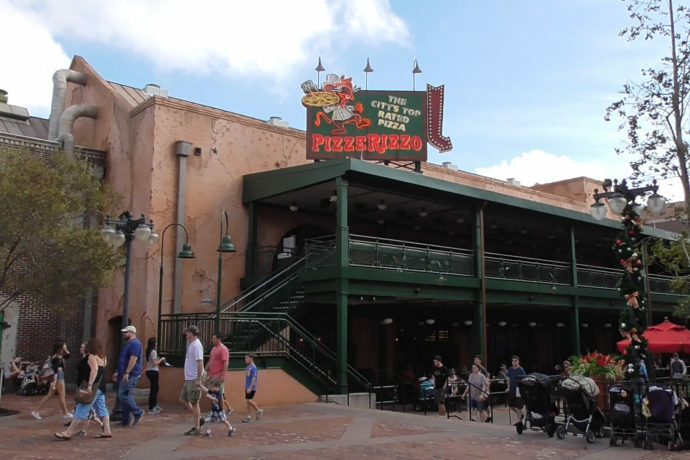 PizzeRizzo, the new Muppets themed pizza restaurant is now open in Muppets Courtyard, replacing the old Pizza Planet restaurant. The new re-skin includes cute funny nods to the Muppets throughout, but otherwise hardly adds to the park’s overall (muddled) atmosphere. And I checked out the new Rogue One props and costumes on display in the Preview Gallery at the Star Wars Launch Bay. See the video and photos below for more information and stay tuned for more theme park updates! Welcome to Hollywood Studios in December! Muppets fountain is now a planter… unfortunately. The wait is over. Your rat restaurant is now open! Welcome to PizzeRizzo. New York style pizza in the heart of Los Angeles! What do you think Phil? I don’t know, how about you Jill? Executives have used these. How fancy. Original artwork for sale on the way out. That’s all for now!